A cheese plate ready to open and serve. 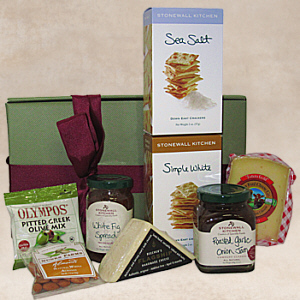 In the box are 3 pairs of cheese, jams, crackers which multiply out to give you a flavorful gift. The cheeses are Beechers Flagship (a classic cheddar from Seattle) and Estero Gold (an Italian Style Montasio from Valley Ford Cheese Co in Sonoma) each will pair beautifully with the White Fig Spread and the Roasted Garlic Onion Jam (also good on Chicken and Pork Chops). There is a choice of two crackers from Stonewall Kitchen: Sea Salt and Simple White, along with Olives and Nunes Farms Almonds. Packaged in our classic Fancifull green box and ready to delight someone you know. Note: If shipping East of the Rockies please pick 3 day shipping, it will ship on a Monday or Tuesday so it doesn't sit over a weekend.